ONE OF THE MOST EXCITING and progressive trios to emerge in recent years has been Troyka, the members of which have also become key players in a host of other contemporary jazz and jazz/rock projects: Chris Montague (guitar, loops), Kit Downes (organ, keyboards) and Josh Blackmore (drums). Their most recent album, ‘Moxxy’ (Edition Records, 2012), created a surge of interest for the band’s creative process of responding to an array of musical sources and influences to deliver their unique and heady mix of improvised jazz, rock, funk and electronics. Troyka’s live gigs are like no other, these three masters of their craft intuitively creating a mesmerising, sparky, sensory experience. So, with that same visionary spirit, how about augmenting the trio with the power and depth of a big band? Crazy? Well, what ensued was nothing short of a jazz sensation! Montague, Downes and Blackmore assembled an 18-piece of brass, reeds, bass and vibes (personnel listed below, including familiar names such as Reuben Fowler, James Allsop and Mike Chillingworth) under the direction of Royal Academy of Music Head of Jazz, Nick Smart, who would bring a very different dimension to their music. To re-visit a sound originally built on a collective understanding between three, and widen its scope to a much larger ensemble, must have been something of a challenge – but the result, hearing it captured from the live setting of this year’s Cheltenham Jazz Festival (originally recorded for BBC Jazz On 3), is both exhilarating and enthralling (and difficult to categorise – though try to imagine a hybrid of Dave Holland, Matthew Herbert and Beats & Pieces plus Keith Emerson, Billy Cobham and Hendrix!). Anagram antics are plentiful in the titles of some arrangements of existing pieces, so Dropsy changes to Dry Ops, Chaplin becomes Hip Clan, Zebra turns into Braze… but it’s the musical transformations, of course, that amaze, along with specially-written new pieces. Opener Dry Ops confirms straightaway the successful fusion: brass section able to echo the instantly-recognisable technique of Montague’s guitar/effects with similar spike and crackle, as well as combining with the reeds to fashion a tight NYC-sounding orchestration, whilst also allowing space for individual improvisation. The big band scoring of Gain Noon Soon sounds particularly demanding, but this ten-minute number really sparkles, Blackmore just astonishing with the complexity and rapidity of his drumming. Braze is such a fantastic development of the original trio piece, Downes impressing with signature firecracker organ/keyboards and Montague bristling on lead guitar, whilst incisive chordal stabs and mischievous vibes add peppy colour. Misterioso Elegant Her‘s mournful, bluesy trumpet opening and slide guitar precede an increasingly urgent pace which eventually unfolds into a particularly BIG band sound and a great coda, Downes and Montague rocking (crank up the volume for a superb live feel!). Coley‘s funk-driven groove – led by the Troyka trio, bassist Louis Van Der Westhuizen and Ralph Wyld on vibes – is so gripping, featuring great organ, trombone and tenor soloing. The spacial Hip Clan – a ‘Moxxy’ favourite featuring Chris Montague’s atmospheric Floydian guitar lead – takes on a different timbre as sustained brass and reeds, with vibes, seemingly float it beyond the clouds. Finally, the cryptically-titled 80 Neon Births teases with big band swing, only to develop into an enveloping electronic haze against Blackmore’s percussive power before a blazing, full-on finale. 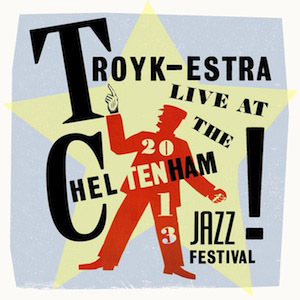 Those present at Cheltenham’s Parabola hailed Troyk-estra’s performance as “unforgettable”, “stupendous”, “jaw-droppingly amazing” – and, with this closely-recorded and remixed live account, we now have the opportunity to enjoy much of that magic for ourselves. Launching at London Jazz Festival on 23 November 2013 (Purcell Room, Southbank Centre at 3pm), with a general release date of 2 December 2013, this remarkable debut album is available from Impossible Ark at BandCamp. Prepare to be dazzled!